Perfectly positioned to quickly access everything in Nashville! (see location tab for exact proximity to specific destinations) This home features 3 bedrooms on the main level and 2 full baths. All 3 bedrooms have queen beds. 1 full bath located in master and the 2nd full bath is shared in the hallway. 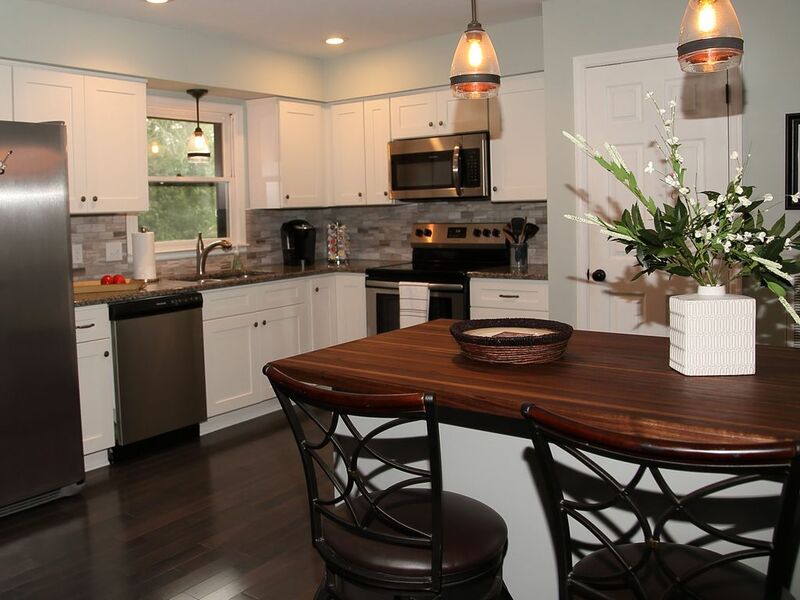 Fully stocked kitchen was recently renovated with white shaker cabinets, granite counters, and stainless appliances. Nice large deck off the main living area. Even more space and living area downstairs! Full finished basement with huge rec room including a full size pull out bed. There is a 1/2 bath downstairs as well. Guests are welcome to park and use 2 car attached garage. The setting of this home is so peaceful! It is so close to everything Nashville has to offer yet feels like you are staying in the mountains. You will not be disappointed! About owners Rick and Kathy: Rick is a native Nashvillian. After meeting and marrying Kathy in Knoxville, she joined him here over 40 years ago to raise their family. Now that they are retired, they are frequently travelling to visit family (doting on their grandchildren), cheering on the University of Tennessee Volunteers and enjoying warmer destinations in the winter. They hope others will enjoy their family home while exploring this great city. About property manager: Maggie Edwards is our property manager as well as a relative in our big Oakley family. She will be the one you are in contact with before and during your stay. Maggie is a Realtor in the Nashville area but also enjoys managing this short term rental as well as one other in the general area. As a Nashville native, she is very familiar with all areas of Nashville and serves as a great resource should you need recommendations. Along with her husband and 1 year old son, Maggie enjoys boating, taking her dog to the park, craft beer, and trying every new restaurant that hits the Nashville food scene. She has a wealth of information for those needing Nashville guidance. We are committed to providing southern hospitality and that extra touch that makes your stay special. Please let us know what brings you to Nashville so that we can prepare those special touches to make your stay far above the rest! Enjoy! *If this home is too large for your needs, the other home Maggie manages can be found by searching "885511". It is a 2 bedroom/2 bath home. That home has been up and running for 2 years and has many 5-star reviews. You will receive the same level of cleanliness, amenities, communication, and care as the guests describe in those reviews if you book this wonderful Hidden Oaks Getaway. The front door is up a relatively steep sidewalk plus 4 stairs. We will be coming back! Great home for giving everyone their own space. The finished downstairs is very open and great for kids. The upstairs has a big area where we celebrated Thanksgiving dinner. Made in the well equipped kitchen! The only caveat is it is near the airport so expect the sound of airplanes, though indoors it was hardly noticeable. We had an awesome time in Nashville and the house made our stay effortless definitely going back.